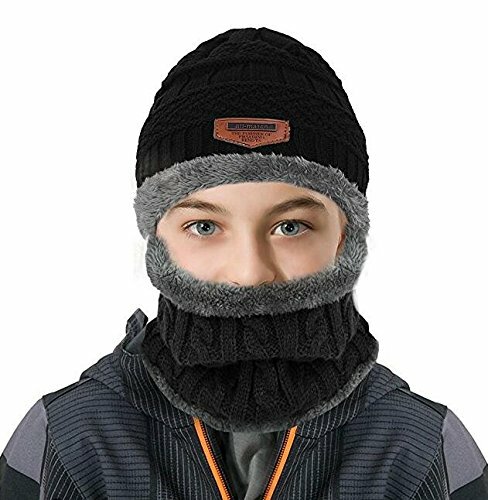 2-in-1 kids winter hat and scarf set —you can use this multi-function beanie hat and scarf set together or separately as you want. ★Folding light weight snow ski caps could cover your ears to provide extra warm on your ears and your cheek.Thick fleece lined loop infinity scarf give your neck warm soft feel. ★Delicate sewing thread, give you the added durability. Size: beanie around from 17 to 18.8 inches,scarf perimeter about 15 inches,Suitable for girls and boys (5-14 years). 2-in-1 kids winter hat and scarf set —you’ll use this multi-function beanie hat and scarf set together or one at a time as you wish to have.